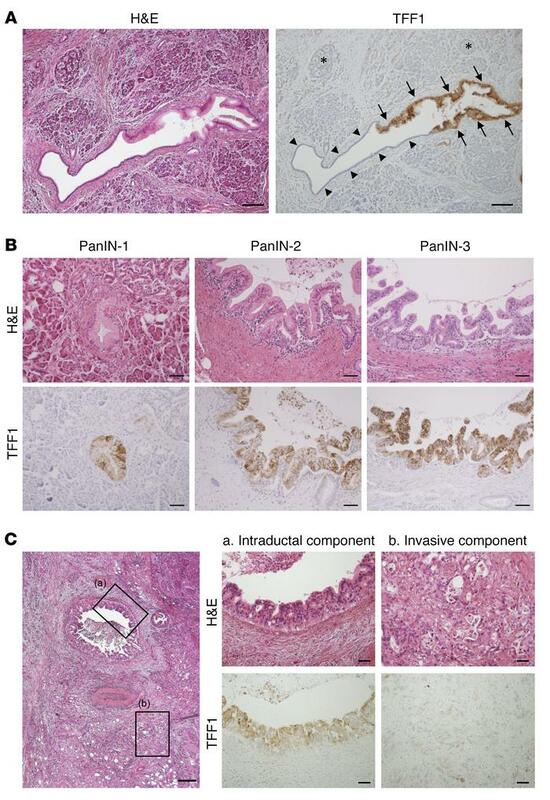 TFF1 expression is lost in the invasive component of pancreatic adenocarcinoma. (A) While abundant TFF1 expression was observed in PanIN (arrows), it was not observed in other pancreatic components, including acinar cells, islet cells (asterisks), and ductal epithelial cells (arrowheads). Scale bars: 100 μm. (B) The expression of TFF1 was confirmed in all grades of dysplasia. Scale bars: 50 μm. (C) TFF1 expression was observed in the intraductal component of PDAC and was lost in the invasive component. Scale bars: 200 μm (left panel); 50 μm (middle and right panels).